Once you have found the only person that can make your heart leap in such a way, it’s time to start thinking about what kind of ring you will want to wear forever. 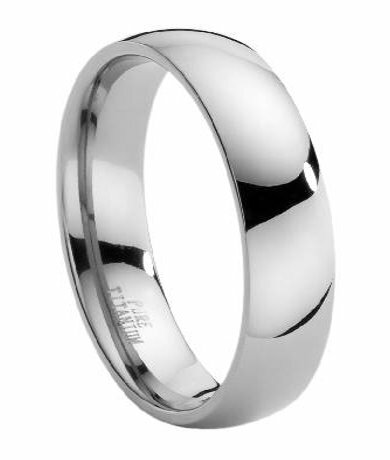 Celebrate your big day by wearing our 6mm men’s comfort-fit titanium band with a domed polished finish. This traditional ring is timeless and will never fade out of style. With a polished exterior and interior, this ring will complement your gleaming smile as you walk down the aisle with the love of your life. Each comfort-fit titanium band with a domed polished finish is made from aircraft-grade titanium, which is so strong that it is used in numerous aeronautical applications. Titanium boasts one of the highest strength-to-weight ratios of any transition metal, and it will never fade or lose its shine. 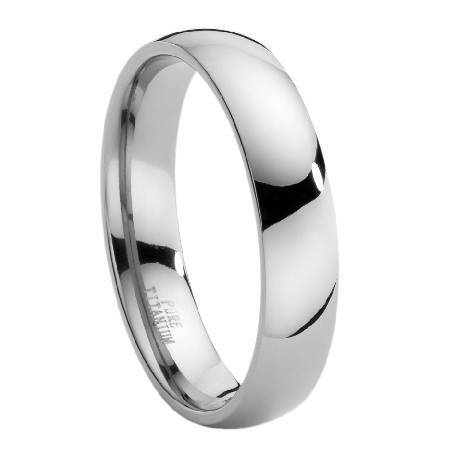 Our 6mm men’s comfort-fit titanium band with a domed polished profile is truly exquisite. We offer a wide variety of sizes, ranging from seven to 20, so you are guaranteed to find the perfect fit. We find that titanium is an excellent solution for grooms who like the look of platinum, palladium, or other precious metals. 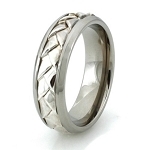 Best of all, you can own a titanium ring for a fraction of the price you might pay for white gold or sterling silver. Every comfort-fit titanium band with a domed polished finish we offer is crafted using extra metal to create a domed effect. Comfort-fit rings tend to measure a half size smaller than tradition wedding rings. We recommend that you have your finger sized for accuracy by a professional jeweler. If you have any questions about this wedding band, please contact us today for additional information or further assistance. Very comfortable fit. I replaced a platinum ring with this so that I could wear it more regularly when doing physical work and not need to worry about scratching it. Surprisingly I actually now prefer the titanium due to it being so lightweight. I bought this ring for my husband because he has a really hard time finding rings his size. He loves is so much. He highly recommends this company. Can't rate the ring or the company high enough. I had to exchange rings three times to get my size right and, no questions asked, they complied quickly and professionally. I'm totally satisfied and I highly recommend JMR and their products....hope to be giving them more business. Great Price, great product, Great Service, excellent fit, and very comfortable. Good ring for my husband, ordered half a size bigger due to comfort fit and fits him great.